Heroic Choices « Mike Henry Sr. I was struck by this. I often mistake the sense of the heroic for being a hero. I want to do the grandiose thing, the heroic thing, rather than simply living as a hero. Being a hero is a drudge most of the time. It’s hard to make the right choice over and over during each day. I have to pick up the trash, and empty the diswhasher. I have to avoid personal use of my time at work and make sure I am available for my co-workers even when they ask me about things they should already know. I must go to the gym in the cold (which I didn’t do today) and I must be diligent with my money. I even have to be patient in line at the airport or the grocery store. Being a hero is a slog. It’s work. Heroic is much easier. I can simply be whatever I want to be until some opportunity comes along where I get to put on the hero suit and arrive as the champion. If I’m lucky, it’s a great opportunity where I step into the gap, become a huge hero and live famously off of that success for years. Also, if I’m lucky that opportunity comes along early so I can do it once and be done. If I’m not so lucky, I will have to be ready to be a hero for a long time or I might miss my shot. How are you with the contrast between the sense of the heroic and being a hero? Have you been lucky enough to get by with the heroic path yet? How’s that working for you? Heroic is about opportunity and timing. Hero is much harder. I heard a speaker yesterday say that we have 20,000 moments in each day. A good day may come down to 2 or 3 moments that went particularly well. Or a bad day may be a moment or two that didn’t go so well. But the majority of our moments are just moments. We plug along. A hero chooses the heroic of every moment. Sometimes it’s heroic to choose to rest or to say “No” to an opportunity. It’s often heroic to choose to do the important thing rather than the grandiose or urgent or dramatic thing. Being a hero means committing to make heroic choices in every moment. It sounds like a lot of work. It IS a lot of work. But it gets easier with time and there are great rewards. Heroes, real heroes, are the people of legacy. They make a positive difference in everything they do. They make a lasting impression and create a positive culture in their sphere of influence. Hero’s are the people we remember for a long time. 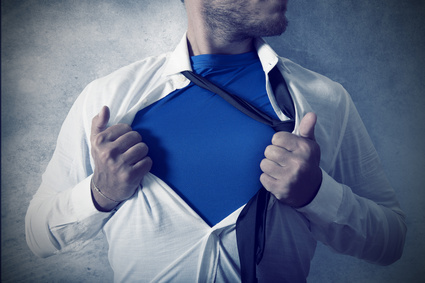 Maybe your grandfather or a teacher or an early boss was a hero for you. Being a hero is a long, slow choice rather than a one-time lottery event. Waiting for the heroic will mean that you miss many opportunities to be a hero. One big opportunity or thousands of small ones: it’s your choice.